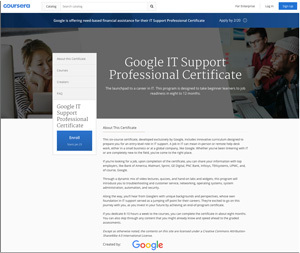 This week Google and Coursera will officially kick off a certificate program that offers training to people who want to enter the information technology field but lack the time and resources for a formal education. A new series of massive, open, online courses available through Coursera and developed by Google experts will train beginners and prepare them for job readiness in eight to 12 months, according to the two companies. All of the courses will be open on Jan. 23, and while students may choose to take the courses in any order, the organizers have suggested they be taken in the same order as the list above. The cost for the certificate program is $49 per month. According to a blog post by Natalie Van Kleef Conley, a Google product lead, during a period when she helped hire Google IT staff, "I knew that candidates didn't need traditional four-year college degrees to be qualified — and also found that IT was very teachable." She noted that Google developed a program for training and hiring "non-traditional talent for IT support internships and full-time roles" through a partnership with nonprofit Year Up. That training formed the basis of the Coursera work, which Google hopes will reach a broader base of participants. The first course, which is the only one with public syllabus details, lasts six weeks. All of the courses state that participants can expect to spend between eight and 10 hours per week on the work, which consists of watching videos, doing readings, performing hand-on labs, participating in discussion forums and taking practice and final quizzes. Throughout the program, which covers 64 hours of video lessons and the other activities, students will hear from Googlers themselves, talking about how their IT support knowledge led to their current positions. Those who successfully complete the program will also have access to job search help. People will be able to share their information directly with potential employers, including Bank of America, Walmart, Sprint, GE Digital, Infosys and Google, among others. Although Google said it was subsidizing the program to keep it at the $49/month price point, it's also offering "need-based scholarships" through nonprofits, such as Year Up, Student Veterans of America and Upwardly Global. The program is part of Google's "Grow with Google" initiative, which is one of several programs introduced under a billion-dollar commitment Google has made to help nonprofits provide skills training and education to workers, especially those hit hard by the country's loss of industrial jobs.